Several years back when I had a garden I grew bell peppers. The only problem is they never got very big. I had grand plans of making stuffed bell peppers with them. So I created this dish. 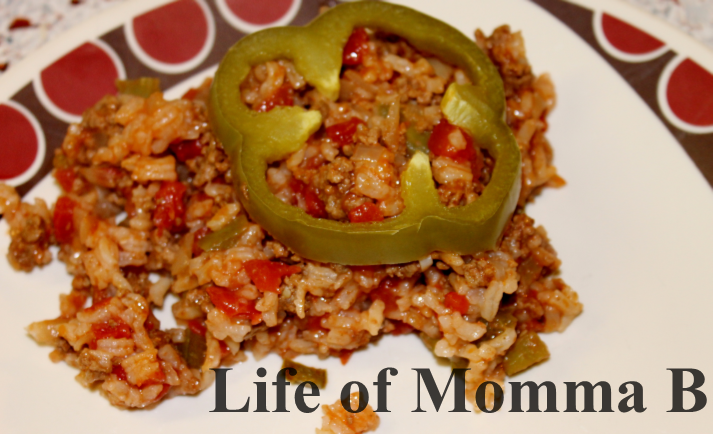 It is all the flavor of stuffed bell peppers in a casserole form. Since then, I have not made true stuffed bell peppers. This recipe is so much easier, I will never go back. In a skillet, cook first three ingredients until the meat is done. Drain any excess fat. Add remaining items to the skillet. Bring to a boil; reduce heat, cover and simmer 15 minutes. Place in an oven safe casserole dish. Cover and bake at 350 for 30 minutes. Tip: For an added flare add bell pepper ring to the top of the casserole dish before baking. This entry was posted in Recipes and tagged beef, bell pepper, gluten free, main course, peppers, rice, tomato. Bookmark the permalink.